A new method of selectively binding proteins to nanoparticles has been described by a team of German and Chinese researchers headed by Prof. Bart Jan Ravoo, a chemist at the University of Münster (Germany). The nanoparticles automatically recognize specific peptides, i.e. small proteins, and enter into highly selective binding with them. Among the model peptides the researchers examined were amyloids. 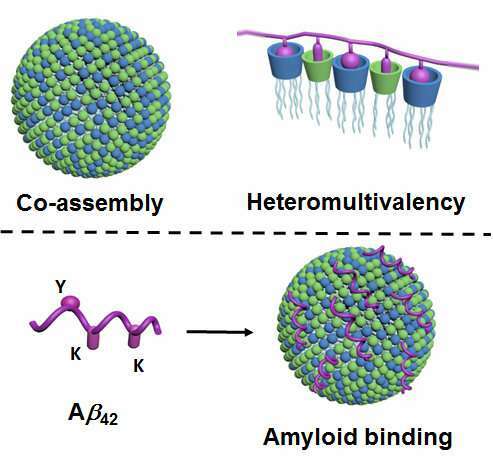 Deposits of amyloids play a major role in Alzheimer's disease, for example, so the researchers are hoping that the mechanism they have discovered might provide a new approach to treating diseases in which such deposits occur. The study has been published in the latest issue of Nature Chemistry. The interaction between protein molecules or between them and other biomolecules plays a major role in very many physiological processes. In this context, molecular recognition entails the binding of proteins through multiple nanoscale points of contact on the surface of the protein. Typically, very many of these points are involved, resulting in a unique, exact and complementary contact surface. The mechanism these protein molecules bind is therefore described as a "key-and-lock principle." The researchers have now described a method for producing such contact surfaces on nanoparticles so that selected proteins can be targeted and bound. What is new about the method is that it is based on the principles of co-assembly and so-called heteromultivalency. Co-assembly means that the nanoparticles are not—as is otherwise usual—produced as a result of complex and tailor-made chemical synthesis. Instead, the researchers produce them using a relatively simple method in which two lipid-type ("fatty") components are mixed in water and spontaneously form the nanoparticles required. These particles are adaptive, i.e. they change their inner structure and thus achieve optimum binding to the target protein. "Heteromultivalency" means that the nanoparticles form a very large number of different points of contact which, at the same time, interact with the protein. Following the example of natural physiological processes, a particularly high selectivity thus occurs. "So far, this principle of heteromultivalency in particular has scarcely been examined in detail or exploited," says Bart Jan Ravoo. "We describe an entirely new approach which will make it possible to develop further synthetic protein binders. This could be considered for use in diagnostics or imaging—or as potential active ingredients in medicines." The researchers have shown that the nanoparticles bind with amyloids and, as a result, dissolve aggregates of these peptides. The occurrence of amyloid aggregates is closely connected with the development of Alzheimer's. This is why the new method might provide an approach for developing new types of treatment. It has not yet been clarified, however, whether the amyloid aggregates do indeed cause Alzheimer's or are, rather, a result of the disease. Moreover, the new method for dissolving the aggregates has only been tried out in a test tube. Further studies are therefore necessary in order to assess more clearly its potential as an approach to treatment. The researchers used amphiphilic, water-soluble cyclodextrin and calixarene molecules as co-assembling components for the nano-contact points. They examined the binding of the resultant nanoparticles to the peptides, using for example fluorescence spectroscopy. They used electron microscopy to demonstrate binding to the amyloids.